Hair and Makeup is such an important subject, concerning your wedding day. It is good to do your research early, and hopefully with a dress chosen. When you do your trials, wear a top that's color closely matches your dress, to gauge better makeup results. Head to the mall makeup counters, like MAC or L'ancome, and as for a trial. This usually is free, if you go to a counter of the makeup you wear, maybe purchase a lipstick or something small. Your trial run should help find a pallet best for your skin type, color, and how to enhance your features. Gain the knowledge of the girls at the counter, how much they know what light will do for picture taking, etc. Share with them what YOU want, do not suggest to them to do what they think is best. Sometimes you can get lucky by having them suggest, but you might be in front of a less experienced individual who'll paint you up like a Picasso, trying new hues that have just come out. Unless that is what you want, I wouldn't suggest this. Bring in your makeup you wear normally, so they know what you do that you like, and they can better read your mind. If you tell them that you can go dramatic in your eyes, even if you are very fair skinned, make sure they understand what you mean by dramatic. If you want the dark smokey eye, and the makeup artist feels like corals are better for you, speak up! This is coming from experience, I am very fair, yet my dark blue eyes enable me to add a little dramatic smokeyness, and it doesn't look too much, it lets my blues stand out with my blond hair. My trial run with my makeup artist, I didn't speak up, she saw how fair I was, and I was not happy to have the pink/coral hues on me. 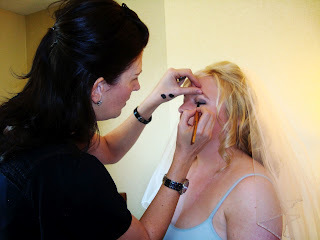 We had to book another session, which I brought to her the eye shadows I use, and the end result was far better, and I was then confident I'd look great on the wedding day, at least in the makeup department. Same thing with getting your hair done. Trial, trial, trial. Obviously, the first place to look is the magazines. Pick a variance of styles you like. Half up, half down, all up, all down, different looks in all the categories. Look out for award shows, where the ladies are red carpet fabulous, many brides get their inspiration from this, I did from the 2008 Golden Globes. I loved how Hayden Panettiere's hair and makeup looked, I then found the posting on the internet next day, printed it, and took it to my hair stylist, with a few other looks. My stylist put as much energy into my trial, as the day of the wedding, which I was grateful for. I added extensions to give my hair not just added length for curls, but volume to withstand the hours of the day. She knew what I wanted, and the end result was wonderful. Another check off the list to not be concerned over. That is hopefully how you feel, you don't want to be nervous for your makeup and hair, you want to feel confident that you'll be in good hands with the artists, which helps you to relax and be at ease. If you don't have a hair and/or makeup artist, ask around. Refer to theknot.com public boards and ask who people recommend. More than likely a bunch of them will mention the same individual. If they do, visit her site/blog, see testimonials, call her for a trial. Same with hair, get referrals, and from places like theknot.com where its local to your location, its a great resource to have. Many hair stylists/artists whom work independently will more than likely be able to come to you. I can't believe how relaxed I was the day of the wedding not driving around town, instead, sitting in the hotel room, having them come to me. Salons offer wedding day services, such as Dolce Salon & Spa, with 3 locations in Phoenix, Arizona. They will do your whole hair/makeup and any other pampering needed, for you and for your bridal party. Check out their website, www.dolcesalonspa.com, to view their wedding packages to see if it is in your budget. They are professionals there, and you will be in good hands. Do you have a friend/acquaintance whom is attending cosmetology school? This is a great opportunity for you to save money, yet, they want this practice, and usually they are excited to do wedding hair! She/he might not be licensed yet, but they are on their way, and they are fresh in learning the newest tips, tricks, styles. If you know someone, make sure they are professional and will be on time, etc. You don't want to request them, and they not be professional, you are saving money with them, but you are giving them experience to add to their hours of completion of school. Best advice is not do it yourself. If you want to, that is up to you, and its not a bad idea. Your prep time on your wedding day should be stress free, easy going, having people do services for you, in a hopefully relaxed environment.